Wow! What can we say about this handsome boy! Well Khan is looking for a very special home with someone who can understand the breed and their needs. 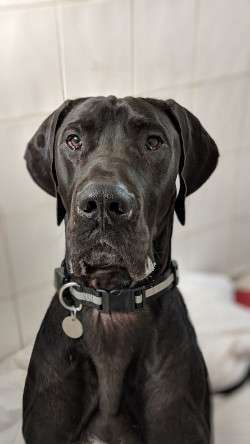 He is a very large lap dog who loves his cuddles and will definitely need his own sofa to snooze on. Khan has sadly found himself displaced more than once and is ready to find his forever home where he can get the love and attention he needs. Slightly unsure of strangers at first, a few pieces of sausage later and he is your best friend. He walks nicely on the lead and socialises with bigger dogs well, however he is scared of smaller ones and will need some socialisation training. Do you have space in your home and heart for this delightful boy?